Woodland Adventurers® Centre for Outdoor Learning (CfOL) is a registered training centre for delivering Office of Qualifications and Examinations Regulation (Ofqual) approved qualifications that are listed on the Qualifications and Credit Framework (QCF) including the Level 2 Award in Forest School Programme Support (QCF). The Woodland Adventurers® Centre for Outdoor Learning (CfOL) Level 2 Award in Forest School Programme Support (QCF) provides learners with the skills required to support Forest School Leaders when conducting Forest School outdoor programmes and activities. It is designed to meet the needs of teachers, youth workers, students and others in providing preparation for further development and study to becoming a Forest School Leader. This qualification is offered in partnership with AptEd, a national Awarding Organisation, regulated by Ofqual and the Welsh Government to develop and offer national qualifications on the Qualifications and Credit Framework (QCF). 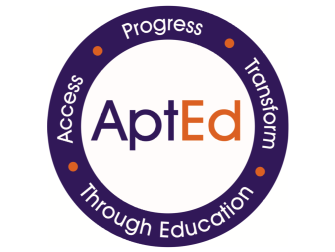 AptEd is a national Awarding Organisation, regulated by Ofqual and the Welsh Government to develop and offer national qualifications on the Qualifications and Credit Framework (QCF). No dates available for Level 2 currently. Please see Level 3 courses. The qualification provides the knowledge, understanding and skills needed for learners to take part in Forest School activities. It enables learners to experience the world beyond the classroom as an essential part of their learning and personal development. Demonstrate an interest in embracing and promoting Forest School principles in educational settings. Clear DBS check (for details see https://www.gov.uk/disclosure-barring-service-check/overview). Visitors attend from all the surrounding areas across the South West including Wiltshire, Somerset, South Gloucestershire and Bristol - from local cities, towns and countryside. Examples include Atworth, Bath, Batheaston, Bathford, Bathampton, Box, Bridgwater, Bristol, Calne, Chippenham, Chipping Sodbury, Cirencester, Colerne, Corsham, Devizes, Exeter, Exmouth, Frome, Glastonbury, Keynsham, Kingswood, Malmesbury, Marlborough, Melksham, Monkton Farleigh, Radstock, Salisbury, Shaw, Shepton Mallet, Swindon, Tetbury, Trowbridge, Warminster, Warmley, Westbury, Westonbirt and many more. We also travel to other locations - contact us for details. The normal course duration includes 3 days of tuition and time allocation for completing course work. Bookings are taken on line using the "Book now" buttons on specific pages. Our other related courses include Forest School - Level 1 and Forest School - Level 3. For further details please click on the buttons below.